When a book is described as price-clipped, it indicates that the portion of the dust jacket flap that has the publisher's suggested retail price has been cut off. This may have been done by the original retail bookseller to avoid customer confusion, or when a person gives the book as a gift, or even by the publisher when remaindering the book. Generally, this is the top corner of the inner front flap of the jacket, but can be located at the bottom of the same flap (more common in European editions; at times publishers even once printed a price in both corners so they could easily change the price once they better understood the marketability of a title). The cut is usually a clean 1-2" diagonal cut, but may also be square. A price-clipped jacket will almost certainly degrade the value of a book, although the extent to which is largely determined by the book itself: its scarcity, demand, and overall collectibility. A jacket that has been price-clipped technically should never be described as better than Very Good condition, although it isn't uncommon to see the statement "... in a price-clipped jacket, else fine..."
It should be noted also, that while uncommon, on occasion one might encounter a book that has been made to appear to be price-clipped in order to disguise the fact that it is a much less desirable book club edition, which are often marked with the statement "Book club edition" where a publisher's price might be. Care should be taken to ensure that the book doesn't have other markings or clues that it might be a book club edition. 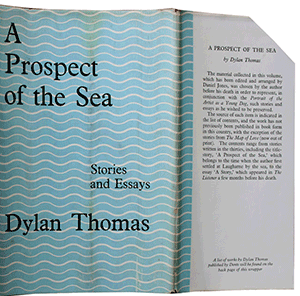 Below is an image of a price-clipped copy of A Prospect of the Sea by Dylan Thomas. While not an extremely expensive first edition ($200 or so in a very good dust jacket), this book would doubtless have been more valuable had the jacket not been price-clipped.